The symptoms of fibromyalgia can be lessened with herbal remedies that warm the body, improve circulation, and reduce inflammation and pain. Five herbs that should top your list of home treatment are cayenne, white willow, lavender, rosemary, and ginger. Cayenne contains capsaicin which offers the long term benefit of reducing the intensity of pain signals sent from the nerves, and may be one of the best topical therapies for fibro. Using cayenne oil in combination with menthol works like an herbal "icy/hot" treatment. Ginger root is warming and improves poor circulation which is a common problem in fibro. Ginger boosts the anti-inflammatory and pain-relieving properties of other herbs and mobilizes the body's own healing agents to ease the pain of fibromyalgia and arthritis. (Weed, Susun. "New Menopausal Years)Ginger can be taken as a tea, used as a bath additive, or infused in olive oil for a herbal oil treatment. 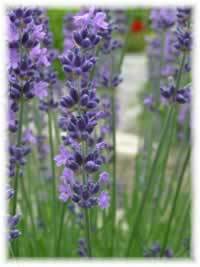 Add a whole body massage with lavender oil in the evening, and rosemary oil in the morning to your daily routine. It is best to do your self massage in a quiet, warm room, with awareness of how you feel emotionally as well a physically. A daily cup or two of willow bark tea provides the equivalent of a low aspirin dose, without the stomach upset that aspirin can cause. It can take a few weeks to build up in your system before you notice a difference. The fibromyagia mind/body connection: Fibromyalgia pain is often accompanied by anxiety, depression, chronic fatigue, and insomnia. This collection of symptoms make fibromyalgia a classic example of a disorder that affects both the body and the emotions, though it is hardly alone in this. Herbal treatments are more effective for fibromyalgia because herbs and aromatherapy work holistically on both the mind and body levels. 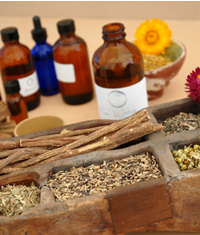 A herbal approach to treatment will include herbs that address adrenal gland support, stress management, and pain relief, as well as emotional needs. Homemade herbal oils and teas, baths, and aromatherapy recipes can help you relieve the muscle aches, pain, fatigue and depression that are symptomatic of fibromyalgia. The traditional Chinese practice of moxibustion involves the burning of mugwort to stimulate the flow of qi and fast relief from aching muscles and sore points. You will often be able to receive this treatment from an acupuncture clinic. At home you can light a "cigar" rolled with dried mugwort, and bring the glowing end near the painful area and move it around in small, slow spirals until the heat becomes too intense. Pain relief often lasts for twelve or more hours. Mugwort also makes a very grounding and relaxing tea. Fibromyalgia diet:	Getting enough magnesium in your diet is needed to moderate pain response. Large amounts are available in oatstraw or nettle infusions, whole grains, legumes and leafy greens. From the seeds of wine grapes come powerful antioxidant and natural anti-inflammatory compounds called procyanidins. For people with fibromyalgia, these compounds help to inhibit the inflammatory response, the chemical reactions responsible for pain and soreness. White, Linda B. M.D.